On June 23, 2012, Robert Ramirez died in OPD custody during an acute medical emergency caused by the ingestion of methamphetamines in what the County Medical Examiner later determined to be a homicide caused by “Asphyxia from Active Prone Restraint.” Witness testimony at the time made clear that the cause of Robert’s death was the violent intervention of 7 Oxnard Police officers. Since then, our community has stood by the brave mother of Robert, Teresa Delgado Ramirez, who has bravely and loudly demanded that those guilty of her son’s killing face some sort of justice (preferably jail). The federal civil rights lawsuit filed by the parents and baby son of Robert Ramirez against Oxnard Police Department officers Steven Ramirez, Michael Bocanegra, Roslynn Wilfert, Pedro Rodriguez, Aaron Zavala, Kyle Brantner and Matthew Ross has now reached its conclusion. ALL officers will be held liable for Deliberate Indifference to Serious Medical needs in violation of Fourth and Fourteenth Amendment, Violation of Civil Rights under 42 U.S.C. § 1983 (use of Excessive Force in violation of Fourth Amendment), and other civil rights charges. Baby Robert Ramirez Jr. will be awarded $1.5 Million, and the parents (Teresa and Guillermo) will be awarded $750,000 each (approx. $2.9 million TOTAL). Just a few months ago, the City of Oxnard and the Oxnard Police Department were offering $0, not even wanting to pay the $20,000 burial costs – so the family retained the services of a new attorney, Dale K. Galipo. Upon hearing the news, reportedly Oxnard Police Department Officer Roslynn Wilfert had a major breakdown, crying when she heard the verdict. It is quite possible that the Oxnard Police Department will appeal the decision. This has been a long journey, but overall we can say that this has been a victory for the family and our community, who have insisted – even when the District Attorney blamed Robert for his own death – that the Oxnard PD MUST be held accountable for violently intervening and choking Robert to death when he required urgent medical attention. To the City of Oxnard and the Oxnard Police Department: You made your bed, now lie in it (Fue tu decisión, ahora acepta las consecuencias). Their insistence on ignoring the voices of protest and outrage over the behavior of OPD officers has led to this situation. Now we understand that their unwillingness to impose needed structural and personnel changes will lead to more headaches in the future, especially since it has been revealed that they have FIFTEEN incidents of police brutality that are PRESENTLY being investigated (not including the 2012 victims)! Combined with the $6.7 million settlement for the shooting of Alfonso Limon, Jr., the Oxnard Police Department have now been forced to pay nearly $10,000,000 in settlements. This just shows that officials in the City of Oxnard are willing to pay unlimited sums of BLOOD MONEY to cover their officers’ crimes. Indeed, the City of Oxnard’s negligence and unlimited support for the brutality of the Oxnard Police Department is responsible for the claiming of several innocent lives. 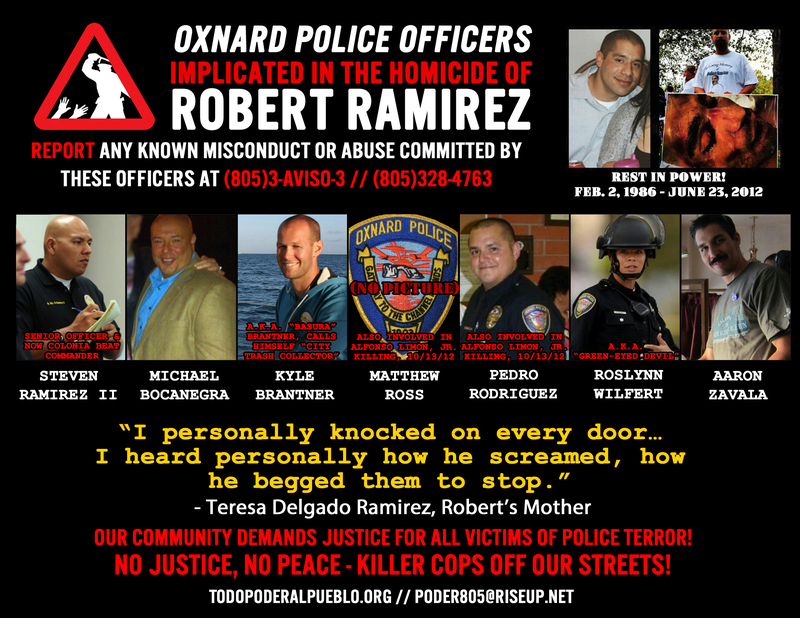 Since 2012, the Chief of the Oxnard Police Department, Jeri Williams, has overseen the deaths of Robert Ramirez, Michael Mahoney, Alfonso Limon Jr., Jose Zepeda, Juan Zavala, and Meagan Hockaday. Meanwhile, Ventura County District Attorney Gregg Totten has never encountered an incident of police terror and abuse that he has not supported. Residents should now look at the officials who will go to any length to cover the brutality of the officers they control, the officers who occupy our streets for the purpose of imposing violence on our communities as a first resort, either out of cowardice or simply out of habit. Until we organize our communities to demand REAL CHANGES that lead to an END to police terror, as well as the incarceration of officers guilty of such crimes, we can expect many more millions of dollars to be paid out of the pockets of Oxnard’s taxpayers. The struggle will never end in the courtrooms, but in the streets where our communities must continue fighting to defend ourselves, our families, and our neighbors from ANY attempt to violate our rights or harm us in any way, shape, or form. NO JUSTICE, NO PEACE ~ KILLER COPS, OFF OUR STREETS! The struggle continues to demand justice for ALL victims of police terror! LA LUCHA CONTINUA… ROBERT RAMIREZ — PRESENTE!